There are many options that we can choose when we are planning to travel to different countries. Many people would choose sitting on a tropical beach and waking up leisurely around midday after an exciting stroll in nightlife district. We would like to see places and do everything freely. However, for serious travellers, there is one country that could keep them wondering whether they can visit it. The Democratic People’s Republic of Korea is better known for its nuclear ambition and authoritarian rulers. However, there are plenty places to visit in the country. The more common way to reach North Korea is by looking for travel companies in Beijing, China. These travel agents should provide us with good direction to travel better in the country. Before we go to North Korea, it is a common rule to bring Euros, instead of US Dollars. The latter is accepted, but prices are better in Euros. Foreigners are discouraged to have and use DPRK’s currency. When we first arrive in Pyong Yang Airport, we will be greeted by a huge Kim Il Sung picture and we will see many more. When we visit North Korea, there should be some awesome guides who are very knowledgeable and friendly about everything. They could be full of questions about our private life and talking with them could provide us with much insightful information. It is actually a nice feeling to know these people. Despite their relatively restrictive country, we could find that North Koreans are decent people. We would be offered to have a cameraman who walks around with the group and by the end of the trip, we could buy the VCD, which is obviously an interesting souvenir that can’t miss. Although only great things about North Korea will be shown, it is a good idea to have such a VCD. The first time we hit the downtown Pyongyang, we could be impressed at how clean the city is. Although the city may not look technologically-advanced, it definitely feels less cluttered than major cities, like Seoul and Tokyo. 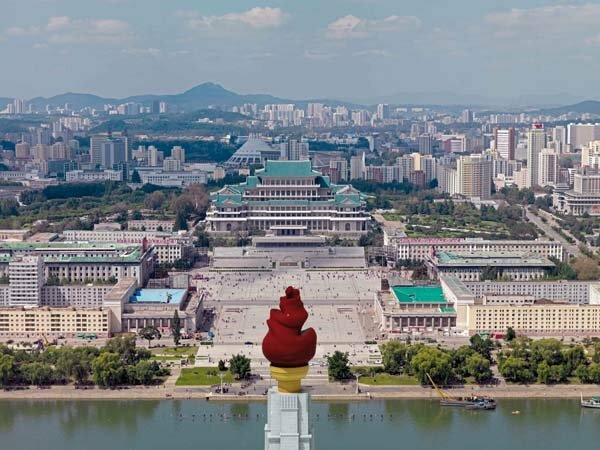 There are many wide open spaces in Pyongyang and huge water fountains where people walk around. The power of smile is really apparent when approach these people. Some of them may offer us brief jamming sessions with their guitar. In specified areas, especially where we are in the best places of Pyongyang, there shouldn’t be any restriction on taking photographs. Other important landmark of Pyongyang is the huge Kim Il Sung bronze statue at Mansudae. It is said that the big statue weighs equally with the hearts of all Korean people, both North and South. We could get a few flowers and lie them down at the foot of the statue and pay our respect by bowing, which is a simple and interesting ritual to do in North Korea. Even if we don’t approve the way Kim Jong Un rules the country, we could just accept and perform these rituals.